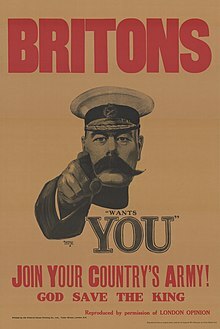 Lord Kitchener’s Call of Duty 1914 – Your Country Needs You! Lord Kitchener Wants You was a 1914 advertisement by Alfred Leete which was developed into a recruitment poster. It depicted Lord Kitchener, the British Secretary of State for War, above the words “WANTS YOU”. Kitchener, wearing the cap of a British Field Marshal, stares and points at the viewer calling them to enlist in the British Army against the Central Powers. The image is considered one of the most iconic and enduring images of World War I. Prior to the institution of conscription in 1916, the United Kingdom relied upon volunteers for military service. Until the outbreak of the First World War, recruiting posters had not been used in Britain on a regular basis since the Napoleonic Wars. UK government advertisements for contract work were handled by His Majesty’s Stationery Office, who passed this task onto the publishers of R. F. White & Sons in order to avoid paying the government rate to newspaper publishers. Britain declared war on the German Empire on 4 August 1914 and the first run of the full-page ran the next day in those newspapers owned by Lord Northcliffe. 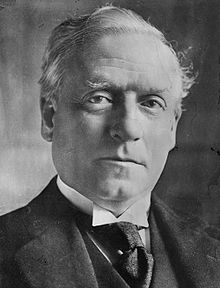 Prime Minister of the United Kingdom H. H. Asquith had appointed Kitchener as Secretary of State for War. Kitchener was the first currently serving soldier to hold the post and was given the task of recruiting a large army to fight Germany. Unlike some of his contemporaries who expected a short conflict, Kitchener foresaw a much longer war requiring hundreds of thousands of enlistees. 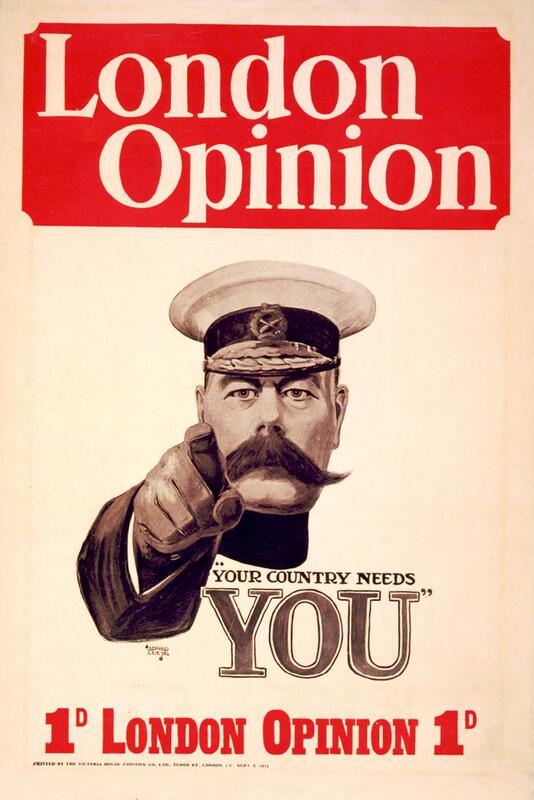 According to Gary S. Messinger, Kitchener reacted well to Field’s advertisement although insisting “that the ads should all end with ‘God Save the King’ and that they should not be changed from the original text, except to say ‘Lord Kitchener needs YOU. '” In the following months Le Bas formed an advisory committee of ad men to develop further newspaper recruiting advertisements, most of which ran vertically 11 inches (28 cm), two columns wide. Alfred Leete, one Caxton’s illustrators, designed the now-famous image as a cover illustration for the 5 September 1914 issue of London Opinion, a popular weekly magazine, taking cues from Field’s earlier recruiting advertisement. At the time, the magazine had a circulation of 300,000. In response to requests for reproductions, the magazine offered postcard-sized copies for sale. The Parliamentary Recruiting Committee obtained permission to use the design in poster form. A similar poster used the words “YOUR COUNTRY NEEDS YOU”. Kitchener, a “figure of absolute will and power, an emblem of British masculinity”, was a natural subject for Leete’s artwork as his name was directly attached to the recruiting efforts and the newly-forming Kitchener’s Army. Kitchener made his name in the Sudan Campaign, avenging the death of General Gordon with brutality and efficiency. He became a hero of “New Imperialism” alongside other widely regarded figures in Britain like Field Marshal Wolseley and Field Marshal Roberts. Kitchener’s appearance including his bushy mustache and court dress jacket was reminiscent of romanticized Victorian era styles. Kitchener, 6 ft 2 in (188 cm) tall and powerfully built, was for many the personification of military ethos so popular in the present Edwardian era. After the scorched earth tactics and hard-fought victory of the Second Boer War, Kitchener represented a return to the military victories of the colonial era. The fact that Kitchener’s name is not used in the poster demonstrates how easily he was visually recognized. David Lubin opines that the image may be one of the earliest successful celebrity endorsements as the commercial practice expanded greatly in the 1920s. Keith Surridge posits that Kitchener’s features evoked the harsh, feared militarism of the Germans which bode well for British fortune in the war. 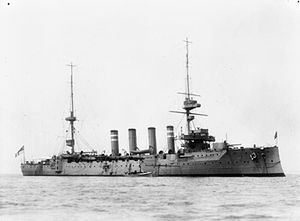 Kitchener would not see the end of the war; he died onboard HMS Hampshire in 1916. See Below for more details on Alfred Leete. Leete’s drawing of Kitchener was the most famous image used in the British Army recruitment campaign of World War I. It continues to be considered a masterful piece of wartime propaganda as well as an enduring and iconic image of the war. Recruitment posters in general have often been seen as a driving force helping to bring more than a million men into the Army. September 1914, coincident with publication of Leete’s image, saw the highest number of volunteers enlisted. The Times recorded the scene in London on 3 January 1915; “Posters appealing to recruits are to be seen on every hoarding, in most windows, in omnibuses, tramcars and commercial vans. The great base of Nelson’s Column is covered with them. Their number and variety are remarkable. Everywhere Lord Kitchener sternly points a monstrously big finger, exclaiming ‘I Want You'”. Although it became one of the most famous posters in history, its widespread circulation did not halt the decline in recruiting. This 30-word poster was an official product of the Parliamentary Recruitment Committee and was more popular contemporaneously. The placement of the Kitchener posters including Alfred Leete’s design has been examined and questioned following an Imperial War Museum publication in 1997. The War Museum suggested that the poster itself was a “non event” and was made popular by postwar advertising by the war museum, perhaps conflating Leete’s design with the so-called “30-word” poster, an official product from the Parliamentary Recruitment Committee. The 30-word design was the most popular recruitment poster at the time having been printed ten times the volume of Leete’s image. Leete’s image has been praised for being more arresting while his accompanying text is also far less verbose. The official wording, taken from a Kitchener speech, may seem more fitting for a character in a Henry James novel. The 30-word recruiting poster was developed as Britons’ collective hopes of the war being over by Christmas were dashed in January 1915 and volunteer enlistments fell. A 2013 book researched by James Taylor counters the popular belief that the Leete design was an influential recruitment tool during the war. He claims the original artwork was acquired by the Imperial War Museum in 1917 and catalogued as a poster in error. Though the image of Kitchener (Britain’s most popular soldier) inspired several other poster designs, Taylor says he can find no evidence in photographs of the time that the Leete poster was used, although a photograph from 15 December 1914 taken at the Lancashire and Yorkshire Railway station in Liverpool clearly depicts Leete’s depiction among other recruiting posters. The effectiveness of the image upon the viewer is attributed to what E. B. Goldstein has called the ‘differential rotation effect.’ Because of this effect, Kitchener’s eyes and his foreshortened arm and hand appear to follow the viewer regardless of the viewer’s orientation to the artwork. Historian Carlo Ginzburg compared Leete’s image of Kitchener to similar images of Christ and Alexander the Great as depicting the viewer’s contact with a powerful figure. Pearl James commented on Ginzburg’s analysis agreeing that the strength of the connotation lies with a clever use of discursive psychology and that art historical methods better illuminate why this image has such resonance. The capitalized word “YOU” grabs the reader, bringing them directly to Kitchener’s message. The textual focus on “you” engages the reader about their own participation in the war. Nicholas Hiley differs in that Leete’s portrayal of Kitchener is less about immediate recruiting statistics but the myth that has grown around the image, including ironic parodies. Leete’s Kitchener poster caught the attention of a then eleven-year-old George Orwell, who may have used as it the basis for his description of the “Big Brother” posters in his novel 1984. In 1997 the British Army created a recruiting ad re-using Leete’s image substituting Kitchener’s face with that of a British Army non-commissioned officer of African descent. Leete’s image of Kitchener is featured on a 2014 £2 coin produced by sculptor John Bergdahl for the Royal Mint. The coin was the first of a five-year series to commemorate the centennial of the war. 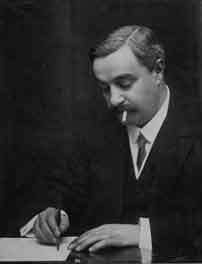 Use of Leete’s image of Kitchener has been criticized by some for its pro-war connotation in light of the human losses of the First World War and the violence of Kitchener’s campaign in Sudan. In July 2014, one of only four original posters known to exist went to auction for more than £10,000. The other three originals exist on display in State Library of Victoria, the Museum of Brands, Packaging and Advertising, and the Imperial War Museum. Leete’s design was also used for a corn maze in the Skylark Garden Centre in Wimblington to mark the centenary of World War I.
Bolshevik recruitment poster from the Civil War of 1920, by Dmitri Moor. “You, have you volunteered? Alfred Ambrose Chew Leete (1882–1933) was a British graphic artist. Born at Thorpe Achurch, Northamptonshire, he studied at Kingsholme School and The School of Science and Art (now Weston College) in Weston-super-Mare, before moving to London in 1899 and taking a post as an artist with a printer. His career as a paid artist had begun in 1897 when the Daily Graphic accepted one of his drawings; later he contributed regularly to a number of magazines including Punch magazine, the Strand Magazine, Tatler, etc. As a commercial artist he designed numerous posters and advertisements, especially in the 1910s and 1920s, for such brands as Rowntrees chocolates, Guinness and Bovril, and his series of advertisements for the Underground Electric Railways Company (the London Underground) were very well known; his work as a wartime propagandist includes the poster for which he is known above all, the Lord Kitchener poster design, which first appeared on the cover of the weekly magazine London Opinion on 5 September 1914. Invitation to one of the regular “smoking” evenings at the London Sketch Club, dated at 11 November 1921. Designed by Alfred Leete.